Species list, classification (e.g. Endemic, Native, Pacific Tramp, Exotic to Pacific), and incidence matrix of data used in this analysis. Aim: The fundamental biogeographical processes of colonization, speciation and extinction shape island biotas in space–time. On oceanic islands, area and isolation affect these processes and resulting biodiversity patterns. In the Anthropocene, a new human-mediated colonization dynamic is altering insular ecosystems world-wide. 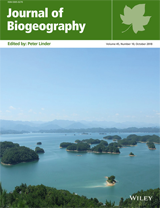 Here, we test predictions about the roles of archipelago area and isolation in structuring ant diversity patterns through effects on both natural and anthropogenic biogeographical processes. Location: Tropical Pacific islands. Methods: We compiled a comprehensive data set of ant faunal compositions across tropical Pacific archipelagos. Using regression analysis we evaluated the bivariate and interactive effects of area and isolation on the number of colonizing lineages, native species, endemic species, exotic species and total richness in the archipelago. Results: There is a strong species–area effect and a much more modest isolation effect on total ant species richness across the Pacific archipelagos. The number of colonizing lineages of each archipelago is strongly driven by the isolation of the archipelago. Endemic species are present in large archipelagos of low and intermediate isolation. The most remote archipelagos are nearly devoid of endemic lineages and their ant faunas are largely composed of Pacific Tramp species and exotics brought from outside the Pacific region. Main conclusions: The prominent species–area curve in Pacific ants emerged over time through multiple processes. The colonization of lineages is determined primarily by isolation, with few or no lineages reaching remote archipelagos. Cladogenesis mediates the isolation effect and increases the area effect through the differential radiation of lineages in large archipelagos. In the Anthropocene, the assembly of the species–area relationship has accelerated dramatically through human-mediated colonization. Overall, our results support a view that species–area curves reflect regulating limits on species richness that scale with area, but that multiple biogeographical processes can occur to achieve these limits.